Angela Lindvall (born January 14, 1979) is an American model and actress. Lindvall was discovered by an IMG scout when she was 14 years old, and immediately signed with IMG New York. She took a break from modeling returning when she was 17 years. She was featured on the cover of Italian Vogue in 1997, photographed by Steven Meisel. She was featured on many top magazine covers in the late 1990s and the early 2000s, such as Vogue, Elle, Harper's Bazaar, Maria Claire, Numero, W, i-D, V and so on. And during the peak of her long career, she was always the world's top designers' favourite, such as Karl Lagerfeld, Miuccia Prada, Stella McCartney. She was a Prada Girl and a Chanel Girl. She has worked as the face of Chanel, Gucci, Valentino, Prada, Calvin Klein, Miu Miu, Dior, Louis Vuitton, Hermes, Versace, DKNY, Roberto Cavalli, Fendi, Missoni, Jil Sander, and Jimmy Choo. As an actress, she has appeared in several films, including CQ in 2001 and Kiss Kiss Bang Bang in 2005 and Small Apartments in 2010. She was the host of the fashion reality series Project Runway: All Stars, an extension of the popular series Project Runway. Karl Otto Lagerfeld was a German creative director, fashion designer, artist, photographer, and caricaturist who lived in Paris. He was known as the creative director of the French fashion house Chanel, a position held from 1983 until his death, and was also creative director of the Italian fur and leather goods fashion house Fendi, and of his own eponymous fashion label. He collaborated on a variety of fashion and art-related projects. He was recognized for his signature white hair, black sunglasses, fingerless gloves, and high, starched, detachable collars. Miuccia Bianchi Prada is an Italian billionaire fashion designer and businesswoman. She is the head designer of Prada and the founder of its subsidiary Miu Miu. As of March 2019, Forbes estimates her net worth at US$2.4 billion. Lindvall was born in Midwest City, Oklahoma, to Randall Lindvall, a pharmacist, and Laura Rasdall, a medical technologist and massage therapist. She was raised in Lee's Summit, Missouri, and attended Lee's Summit High School. She grew 3 inches from the ages of 13 to 14, and her friends suggested that she try modeling, although it was her sister, Michelle, who wanted to be a model. While doing a local Kansas City fashion show, at age 14, a talent scout spotted her and she signed with IMG. A Medical Technologist is an allied health professional that analyzes and tests body fluids and tissues. This includes blood, urine, CSF, synovial fluid, all types of tissue samples, and almost any type of sample removed from a patient for testing. They are responsible for operating and maintaining complex analyzers that are used in a laboratory and ensuring the laboratory results of each patient are accurate and timely. Marie Claire is an international monthly magazine first published in France in 1937, followed by the UK in 1941. 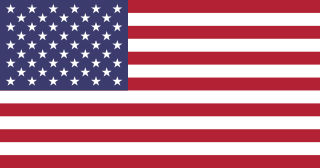 Since then various editions are published in many countries and languages. The feature editions focuses on women around the world and several global issues. Marie Claire magazine also covers health, beauty, and fashion topics. In 2010, she left IMG and signed on with modeling agency Women Management. Following this, she also renewed her contract with Jimmy Choo   and signed a contract to become the face of John Hardy,  appearing in all of the company's advertising campaigns between Fall 2010 and Fall 2011. Lindvall partnered with Bedarida again in early 2011 to create the Hijau Dua collection. A continuation of the Hijau collection, a portion of the proceeds from the sale of Hijau Dua pieces were donated to the planting of bamboo seedlings in Bali. Women Management is a modeling agency based in New York. Founded by Paul Rowland in 1988, Women also has a sister agency, Supreme Management, which is also part of the Women International Agency Chain. Jimmy Choo Ltd is a British high fashion house specialising in shoes, handbags, accessories and fragrances. The company, J. Choo Limited, was founded in 1996 by couture shoe designer Jimmy Choo and Vogue accessories editor Tamara Mellon. The brand claims to have been a favourite of Diana, Princess of Wales. It was listed on the London Stock Exchange until it was acquired by Michael Kors Holdings in November 2017. John Hardy is a jewelry company. Founded by John Hardy in 1975, the company is known for its Asian inspired designs and classical/traditional handmade jewelry techniques. It markets itself as a "sustainable luxury" brand. As an actress, Lindvall has appeared in CQ (2001), Kiss Kiss Bang Bang (2005), and Somewhere (2010). She can also be seen in the DKNY promotional films New York Stories (2003) and DKNY Road Stories (2004). In 2011, Lindvall appeared in the TV series Hawaii Five-0 . Later, she hosted one season of Project Runway: All Stars on Lifetime Television, an extension of the popular series Project Runway . CQ is a 2001 comedy-drama film written and directed by Roman Coppola. It was screened out of competition at the 2001 Cannes Film Festival. 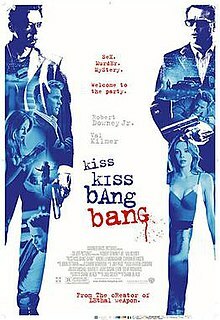 Kiss Kiss Bang Bang is a 2005 American neo-noir black comedy crime film written and directed by Shane Black, and starring Robert Downey Jr., Val Kilmer, Michelle Monaghan and Corbin Bernsen. The script is partially based on the Brett Halliday novel Bodies Are Where You Find Them, and interprets the classic hardboiled literary genre in a tongue-in-cheek fashion. The film was produced by Joel Silver, with Susan Levin and Steve Richards as executive producers. 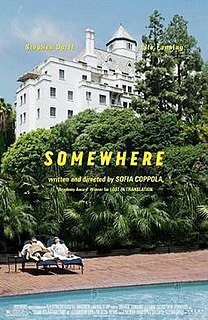 Somewhere is a 2010 American drama film written and directed by Sofia Coppola. The film follows Johnny Marco, a newly famous actor, as he recuperates from a minor injury at the Chateau Marmont, a well-known Hollywood retreat. Despite money, fame and professional success, Marco is trapped in an existential crisis and has an emotionally empty daily life. When his ex-wife suffers an unexplained breakdown and goes away, she leaves Cleo, their 11-year-old daughter, in his care. They spend time together and her presence helps Marco mature and accept adult responsibility. The film explores ennui among Hollywood stars, the father–daughter relationship and offers an oblique comedy of show business, particularly Hollywood film-making and the life of a "star". An environmentalist is a supporter of the goals of the environmental movement, "a political and ethical movement that seeks to improve and protect the quality of the natural environment through changes to environmentally harmful human activities". An environmentalist is engaged in or believes in the philosophy of environmentalism. Sustainability is the process of maintaining change in a balanced environment, in which the exploitation of resources, the direction of investments, the orientation of technological development and institutional change are all in harmony and enhance both current and future potential to meet human needs and aspirations. For many in the field, sustainability is defined through the following interconnected domains or pillars: environment, economic and social, which according to Fritjof Capra is based on the principles of Systems Thinking. Sub-domains of sustainable development have been considered also: cultural, technological and political. While sustainable development may be the organizing principle for sustainability for some, for others, the two terms are paradoxical. Sustainable development is the development that meets the needs of the present without compromising the ability of future generations to meet their own needs. 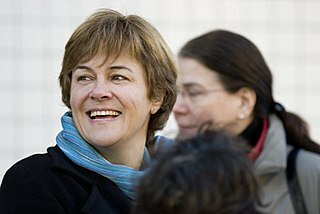 Brundtland Report for the World Commission on Environment and Development (1987) introduced the term of sustainable development. In October 2011, Lindvall started her own line with John Hardy called Angela by John Hardy. Sold on QVC, the collection is inspired by Lindvall's travels and interest in ancient cultures. In 2001, Lindvall went on vacation to Tortola, in the British Virgin Islands, there she met South African diver William Edwards. In February 2002 she gave birth to their son William Dakota and married Edwards that same year. In May 2005, Edwards and Lindvall also had a son together named Sebastian. The couple divorced in June 2006. Shalom Harlow is a Canadian model and actress. Daria Werbowy is a Ukrainian-Canadian model. She is a spokesperson for the French brand Lancôme. Maggie Rizer is an American model, and an activist for AIDS-related causes as well as for Operation Smile. Erin Elizabeth Wasson is an American model, actress, occasional stylist, and designer. Rianne ten Haken is a Dutch model. She was born in Lelystad, Flevoland, and began modeling after she won the 2001 Elite Model Look competition at the age of 15. Aleksandra Igorevna Pivovarova, better known as Sasha Pivovarova, is a Russian supermodel and actress. She is best known as the longest appearing fashion model for Prada, having been in 19 different AD Campaigns as of 2016. Elena Vladimirovna Roslyakova is a Russian supermodel. She has appeared on more than 400 magazine covers, including Elle and Vogue covers. Vlada is considered one of the most influental Russian top models of the 2000s and 2010s. Audrey Kathryn Lindvall was an American model. She was the sister of supermodel Angela Lindvall, and the former face of Coach and Ann Taylor. Anja Rubik is a Polish supermodel, activist, philanthropist, and businesswoman. She is considered to be one of the most internationally successful models of the mid- to late-2000s to today. She currently lives and works in New York. Chanel Iman Robinson Shepard is an American supermodel, known professionally as Chanel Iman. She is best known for her work as a Victoria's Secret Angel. Vogue Paris declared her as one of the top 30 models of the 2000s. SiriTollerød is a Norwegian model. Alison F. "Ali" Stephens is an American model. Sessilee Lopez is an American model. She has appeared in Vogue and graced one of the four covers of its "All Black" issue. Xiao Wen Ju is a Chinese model. She was the first model of Chinese descent to be the face of Marc Jacobs. Esther de Jong is a Dutch model, artist and writer. Molly Bair is an American model, best known for her appearances in the Spring/Summer 2015 fashion shows. Isabella Khair Hadid is an American model, signed to IMG Models in 2014. In December 2016, the Industry voted her "Model of the Year" for Model.com's Model of the Year 2016 Awards. Leona Anastasia "Binx" Walton is an American fashion model based in New York City. Alexis Makenzie Boling, is an American fashion model. She is best known for her multiple covers for Vogue Italia and her appearances in numerous Prada campaigns. Marloes Horst is a Dutch fashion model. ↑ "Angela Lindvall - Model". ↑ "magxone.com - Resources and Information". www.magxone.com. ↑ "Victoria's Secret melekleri çok konuşuldu". National Turk. May 25, 2010. ↑ "Angela Lindvall Heats up H&M". Style Crave. August 13, 2009. Archived from the original on 2010-02-11. ↑ "Angela Lindvall - Fashion Model - Profile on New York Magazine". nymag.com. ↑ "Angela Lindvall's Career Highlights". New York fashion. Retrieved May 20, 2010. ↑ "Angela Lindvall's Photo Diary from Bali". Style.com. June 30, 2010. Archived from the original on 2010-07-05. ↑ "MNN - Mother Nature Network". MNN - Mother Nature Network. ↑ "Press Release: 2005 Best Dressed Environmental List". ↑ "Runaway Success". The Australian. May 19, 2010. ↑ "Angela Lindvall Travels to Bali". Elle. April 21, 2010. Archived from the original on 2011-02-18. ↑ "Sustainable Jewelry". Sustainable and Fair Trade Jewelry Blog. July 2, 2009. Archived from the original on 2010-04-17. ↑ "Hijau By Angela". Women Management. May 6, 2010. ↑ "John Hardy's Eco Paradise". Elle. April 21, 2010. Archived from the original on April 28, 2010. ↑ Slowey, Anne (May 2010). "Elle Fashion Insider Bali High". Elle (297): 102. ↑ "Model Tragedy: Audrey Lindvall dead at 23". Fashion Week Daily. August 4, 2006. Archived from the original on 2007-09-26. ↑ "Audrey Lindvall killed in bicycle wreck". Models Blog. August 4, 2006.